Delayed vs. Immediate Implant Placement: The two camps in this debate are both adamant that their technique is the best and that theirs will give the patients the best long term aesthetic result. Is the literature and available data definitive on this matter? Is the choice really clear for clinicians? This presentation looks critically at the literature and attempts to give clinicians a more flexible approach to immediate and delayed implant placement. Critical surgical guidelines and clinical pearls will be offered for both types of treatment as well as the management of some of the complications that may arise from immediate or delayed implant placement. 1 Controversies Surrounding Delayed vs. 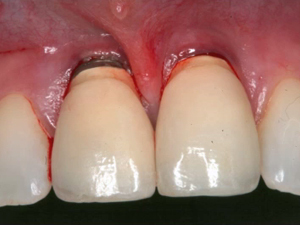 Immediate Implant Placement: Is There No Middle Ground?